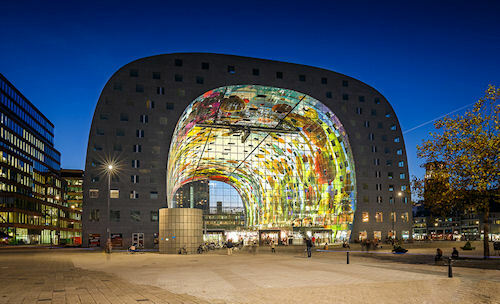 In Rotterdam, the Netherlands, there's an eleven-stories-tall arched building that huddles over an immense food market on the ground floor. The building is also habitable and contains over two hundred apartments. The exterior facade of the building is clad in grey natural stone. But the ends are closed with glass panels to keep rain and the cold out. The vaulted ceiling of the market is adorned with gigantic murals of fruits, vegetables, and flowers, that some have likened to the Sistine Chapel.